VW is one such company that brings in mild facelifts into their model range on a regular basis. Last year, both the Polo and Vento received a few updates, mainly related to addition of some features here and there. To begin 2017 on a high, VW will introduce an all-new variant on the their midsize sedan, the Vento. Christened the ‘Highline Plus’, this new variant will sit above the existing Highline variant. 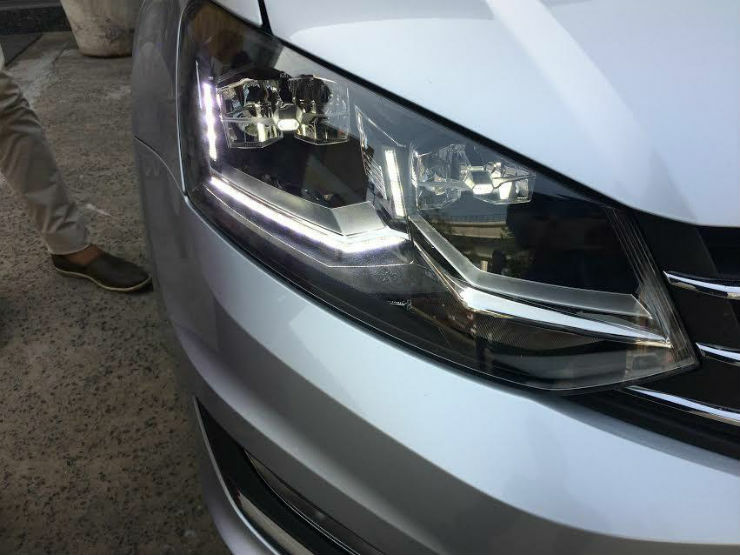 The main highlight of this variant is the fact that the headlamp cluster has been updated and now features LED technology along with LED DRLs, similar to what is offered on the recently launched GTi. In addition to this, the new variant is expected to get a reverse parking camera, something that has been missing on the Vento range. Suprisingly though, the top of the line Ameo comes with the reverse parking camera currently. This variant may also get the new 16″ alloy wheels that have been spotted testing previously. While the variant hasn’t been launched officially, dealers have already begun getting stock of the new variant, which suggests that the launch isn’t too far away. This particualr variant, with LED headlamps and DRLs was first spotted at the 2016 Delhi Auto Expo and has been spotted testing a few times since. However the company has taken their time to introduce the variant. The Vento will continue to be powered by the same engines that are currently on offer. So, you will get the petrol 1.2 liter TSi unit, mated to a 7-speed DSG and the 1.6 liter MPi unit, where as on the diesel front you will get the new 1.5 liter TDi unit with the upgraded turbo which now makes 108 Bhp. The diesel is currently offered in both manual and automatic forms. It will be interesting to see which engines options will be offered with this new variant. There is also speculation that VW might get in the 1.4 liter TSi unit for the Highline Plus model, which will make it a really good option for us power loving enthusiasts.